This is the Daydream Organic Blend brought to you by Noble Coffee Roasting. This popular three bean blend is a sultry mixture of Indonesian and Latin American coffees that is darkly roasted without going too far for a smokey, yet sweet and creamy cup. This coffee is bold with a mix of smoky and earthy flavors. I don't care for dark roast coffee and my preferences should reflect that. Why was I sent this coffee? Too dark of a roast for my tastes. I felt it was a little over roasted with too many bitter notes coming through. Not my favorite. Somewhat too dark of a roast for my preferences. A bit too far on the earthy and bitter spectrum than I'd usually want. Love this one! Really enjoying it. 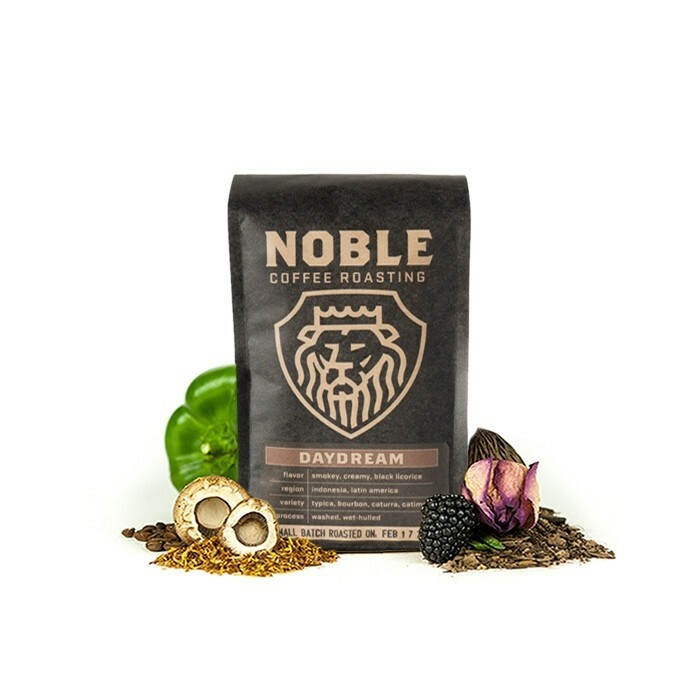 Every coffee from Noble Coffee Rosters has blown me away, and this batch is no different. I love the dark hints of chocolate and the smokiness this dark roast brings. Very bold, with smoky notes, but not overpowering. Smooth, not too sweet, not too bitter. Hints of licorice? I like this. My least favorite blend thus far. I wasn't too impressed with this coffee. I think it's roasted much too dark for my taste. I typically like chocolatey or fruity notes a little more than earthy. I tried brewing this multiple ways (Technovrom, Areapress, Chemex, Kalita) and each time the cup was basically undrinkable. Super dark, tasting burnt and bit like tar. Nice blend - works well as an espresso and retains a solid crema. Seems like the first dark roast I've received and I like it. A little too bold tasting. I didn't necessarily get the whole array of smoky & earthy - but overall it was a bit bitter. I like a coffee that I can chug a few cups of each morning! I have loved Noble in the past, I just think the licorice was a miss. This definitely fits the bill for a bolder coffee, with a lot of personality but still smooth. It reminds me of campfires, not in a bad way. I like this one much more than the previous one. I can taste the smokiness a bit and it is slightly bitter, which is nice. There is a creaminess to it that makes it perfect alone or with milk. I think there is a little chocolate to it. Gotta love that. I don't know too much about bean roast, but I like this one a lot so I must like this type if bean roast. First cup had a very bold not so great flavor (possibly the licorice?). Haven't noticed it on subsequent cups. Generally don't like ti as well as the first set. Great, deep taste to this bold coffee. Great dark cup to get the day rolling, and love that it's organic. And here I thought I didn't like blends.... This produced one of the best cups of coffee I've ever had. Full bodied, great balance of flavors, silky smooth. Already bought 5 more lbs of it and it came fresh as could be with a perfect roast. Great job, Noble. Way too dark and bitter for our taste. Burnt smoky first taste. Almost malty mouthfeel. Sweet notes of molasses and raisin. About as darkly roasted as we'd prefer for a daily coffee. Great pick. I was really really looking forward to this one, as the description is exactly what I typically like in coffee, bold, earthy, and roasted on the dark side of medium. The coffee beans are oily and soft, and provided hardly any initial foaming in my french press-which to me is synonymous with stale coffee. The taste? Tastes like over-roasted stale coffee from the grocery store. This is the first coffee so far that I felt was lackluster, which was a real bummer because the description sounded perfect for my taste. Not a huge fan of black licorice. But, the black licorice taste is very mild, and the coffee overall has a moderately bold taste. Beans were very, very oily and tasted burnt/old. I don't like putting this into my espresso maker. A little darker than I like. But still a good cup. Very nice, rich cup of creamy goodness. Delicious dark blend that is complex and deep. Creamy, delicious. Enjoy this roast more than previous batch. Although it is on the darker side. We really enjoyed this coffee. It was full bodied with a smooth finish. Bold and smooth. A very good coffee with no tangy, acidic aftertaste. I liked this better than the first coffee. The Daydream Organic Blend was a better second following. The coffee was very smooth (not too acidic or sour). Bordered more on the roasty side of the profile. Bean color was a little lighter than what we've typically had (Peet's Major Dickason blend), and noticably less oily. Tasting notes was a very earthy, smooth blend. I preferred the daydream organic blend over the organic Peru. I think that's because the daydream coffee is closer to what I used to drink(folgers classic roast). The extra flavoring in the Peru blend I wasn't a fan of. It's a really strong coffee , I had to turn the strength to the lowest setting in order to drink it. At this setting with a lot of milk the coffee taste great. Almost smokey taste to it which I love. Is it possible to get a bean that's a bit lighter but still smokey/roasty? This coffee is lovely. From the rich, bold odor when it is being ground to the taste. It is a darker bean than my recent coffees, but felt dark, not burnt. Not acidic. Perhaps a bit more earthy than the perfect cup -- I do like my nutty, chocolate taste. But very enjoyable. I normally drink with heavy cream that I have pre-heated a bit so as not to cool the coffee too much. I drank this one first without cream and then with. It's very good either way -- but do use good cream. I was not a fan of this coffee as it is way bolder than I prefer. The earthy and smoky flavor may be interesting for some, but it completely misses the mark with my preferences. It was ok. I tried grinding more to give the coffee more flavor, but it was very bland to me. No nutty tones whatsoever. It was drinkable. Definitely not my favorite. Excellent coffee. Great dark roast with amazing dark chocolate and smokey flavor. The body and overall flavor of this coffee were great. However, the roast/smokey flavor was more of a slightly burnt taste. Not sure if it's meant to be like that or if maybe it was slightly over roasted. I think that if you remove the burnt taste, the coffee would be great, so I'm definitely willing to give it a second chance and see if it's the same or if I was just unlucky and got a slightly over roasted batch. Love it!! Excellent flavor!! Exactly what I like!! Will defenetly want to buy this coffee bean in the future!! Tried it in both pour-over and percolator brewing methods, and I much prefer this in pour over. Overall very satisfying blend, lots of deeper rounded flavors, and no acidic bite in my experience, just a smooth buttery cup of coffee. We preferred the Taylor Farms coffee that we received in the first shipment to this one even though we like a darker coffee. We prefer something that is a bit more complex. We found the Noble coffee to be dark but somewhat boring. This one missed the mark for me. Tastes like a dark roast. Terrific cup of coffee. A little dark but I like it! It's a bit too earthy for my preference. It's not a bad brew, but I was definitely hoping for something less smoky. High fives for being organic! I requested single origin light or medium roast. This is the opposite. Roasted too much for my taste. Harsh at least in my french press. Definitely dark, bold, and smokey. Not for me. Really good cup with our without the sweetness of adding light cream. Strong flavor but still very smooth and easy to drink black. Liked this very much. Smooth yet rich with no harsh bitterness. The black licorice flavor is very strong and it was a bit too smokey depending on how I brewed. Had better results in my French press than pour over, which tasted bitter and ashy. I was able to get a very nice cup out of this but it certainly took some experimenting and the results weren't always exactly pleasant. Really liked this blend. It is a smooth coffee with a lot of flavor without being bitter. Decent coffee pretty strong bitter flavors though. Probably would have been better if I had a pour over but I usually use a press. Love the smokey notes, and the richness. It was better than the last, but too strong for me. Something in the middle would be perfect I think! I did like the earthy flavor though! Great flavor! Not too bitter/acidic, good finish. Tastes really burnt! Tossing most of it! Really like the smell, and brewed in a french press seems to bring up a bit more of the description. Very fragrant, this has to be the most fragrant coffee I have ever experienced. It has a dark chocolatey aroma. The mouthfeel was less oily than I had expected, which I enjoy. Since it is a darker roast, you would expect it to be very oily. Earthy is the only way to explain it: it's like eating a very hearty meal with lots of heavy spices that bubble underneath the tongue but doesn't overpower your palette. Wow, wow, wow! I love the mix here - great with chocolate, and a wonderful overall flavor. This one has quickly become one of my favorites!!! Delicious! Was a little worried about the darker roast, but this was a very easy coffee to drink. Started out fairly bold, but finishes with a slightly sweet taste. Smooth and only a tad bitter. Way too dark and smokey with a strange earthy flavor. Great dark roast coffee. Loved everything about it. Wow! We've hit the nail on the head with this coffee. I know I shouldn't judge a coffee by its packaging - but I love it. A nice black packaging with the cool lion design (and sticker included :D). I love how the coffee details are printed right up front so I know what flavor I should be searching for. As for the coffee itself, love it! Nice dark beans with a great smoky smell. Indeed, I could taste the smokey flavor and black licorice but it wasn't as bitter (as something like Startbucks Pike Roast) and I think that's because of the "creamy" element described on the packaging.I loved researching that coffee and how it comes from the "Noble Tree" line (maybe a connection to name of the Roasting company?) with the "typica" and "bourbon" varieties- which I immediately liked as "bourbon" is my favorite poison - no connection to this coffee though, I suppose. hahaThis is my new favorite coffee. Definitely on track, rich and earthy I still might go a bit bolder. Tastes burnt. Not sure if that's part of the "Smokey Licorice" but I really didn't like this one for pour over. Maybe I'll try it in the espresso machine. Quite of bit of Black Licorice flavor in this one and not a lot of redeeming qualities unfortunately. Excellent brew. Loved the initial shape for the first sip. Very satisfying. This coffee is more darker and heavier than I usually drink. It's the first time I had coffee like this and would probably be the last. A little to bold and earthy for my taste. This one is not good. Way too bold and tastes a lot like Starbucks. Yuck. Very bitter and very harsh. Although the roast isn't too dark as promised in the description the taste not good (at least not to my liking). I prefer something more mild and medium that this coffee. Very smooth, but not a fan of the licorice flavoring. Prefer fruit and caramel/vanilla flavoring notes. Fantastic- rich, complex, delicious. Our favorite so far! Good flavor, a little too dark with grapefruit-y notes that maybe weren't supposed to be there. nicely balanced. my wife often finds the darker roasts bitter but Daydream Organic Blend was perfect! A solid blend, makes a great pot of drip. Good for a morning cup at the office. Flavors aren't quite crisp enough to be a pour over go-to and espresso is average. A great all-around utility blend, but certainly not a complex experience. The prodominance of the black licorice nearly overpowers the flavor of the coffee itself, i didn't love this blend nearly as much as other's I have received. The "flavor" of a coffee (IMO) should never superceed that of the taste of the coffee itself, it should compliment it. In the case of this brew, the smokey elements and black licorice are entirely too pronounced. Its ok. The bag wasn't sealed like the others and it doesn't seem as fresh as the others.... but it still tastes good. Closer to dark than medium. Realized I was probably shortcutting any success by my brewing method. Bought a french press and burr grinder. Huge difference...looking forward to trying even more of these now. This was quite good...remarkably better after getting the press. love the bold flavor and strength of the coffee but its not bitter at all. By far my favorite so far. I was sad when this one was gone! Liked it but have to be careful with oily beans using my super-automatic Jura machine. Maybe a little too dark/heavy for my taste. We loved this. The smokey and earthy notes are perfect - not too harsh, but give it good smell and taste. It also stands up to cream well, which I prefer. Very good coffee. Smooth finish. really enjoyed this one in both drip and chemex. very well balanced and the earthiness and sweetness came through. Bold flavor, little to no acidity. A little too bold for pour over coffee. For our tastes this blend was too mild. Very little coffee flavor. We didn't care for the flavor of this blend. Tastes burnt like a bag of starbuck's espresso. I liked the smokiness. A little darker than what I have been drinking but it hit the mark. I enjoyed it. Not a fan at all. I like black licorice but not in my coffee. Just a very strange blend all the way around. I will stick to my single origin beans after this blend lol. Lovely smokiness. Generally we don't like darker coffees, but this one hits the spot; not charred or even close to over-roasted. Really great, bold, creamy cup of coffee! Loved this blend. Tastes exactly as the description indicates. The flavors excel when made with the Aeropress. We enjoy the sweet, smokey and creaminess of the coffee. Still very good in the daily coffee maker but the flavors aren't as defined. My wife and I have really enjoyed this Coffee. We have Specifically enjoyed its full flavor, and rich body. The smokey after notes are a very very nice touch. We struggled finding a critique for this blend, However i think it could be make perfect in our opinion with the addition of a little caramel note. I'm not a fan of either dark roast coffee or black licorice, but Daydream blend managed to make it work somehow. It's pretty well-balanced and very tasty. Delicious cup. Really happy with this one. I would be interested in trying other in this vain and perhaps something one step down in lightness of roast - but all in all, very good. This coffee isn't for me. It's wasn't as bitter as most dark roasts (which is nice), but the smokiness was overpowering to the point of being unenjoyable. nice richness. preferred slightly when brewed with the french press vs. pour over. this will put some hair on your chest. woooo. not a huge fan. just like another reviewer. I had a hard time dialing this one in on my kalita wave. once I did I got a strong smokey earthy taste. I preferred the la colombe Phocea blend better as it didn't seem to be so much in your face to me. this just wasn't for me. I'm not usually a fan of darker roasts, however I was pleasantly surprised by this. The smokey flavor and aroma of the beans hits you hard when you enter the room. The flavors are unique and oddly pleasantly refreshing. Yummy coffee. It felt rich and sweet and I really enjoyed it. This coffee was good and did have some distinguishing characteristics. I like that. Good blend. Very earthy and smokey. Could taste the tobacco and baking spices flavors as noted in the description. Good coffee with rich body, but the slightly smokey/spicy part of it made it my 3rd favorite. love the deep, full notes. no lingering after taste. was very rich, yet smooth. Amazing coffee. We love this one. Tasted just as described, which I enjoyed. It is very earthy and has a deep flavor that gets better as you progress through a cup. You guys. Every time I get a new coffee I say to myself "this can't possible be better than the last one I got" BUT THEN IT IS!! This coffee is just delicious. It has hints of mocha and bourbon. It's amazing. I put this in the fridge and drank it as an iced coffee in the morning an it transports me to the happiest place on earth. This coffee is what dreams are made of. I really liked this blend. Probably my favorite so far! I made cold brew out of this one and it turned out great. Really liked this roast. Definitely unique. Maybe a little too smokey for me, but a great cup and a good experience. I was a little disappointed at first. It does not have measurement directions. I like to use a french press. It took me 3 or 4 times to get the messurements right. I am still on the fence with this one. That is why I gave it a three. Maybe if it had a suggested measurement from the roast I would like it more. Earthy, smokey, full flavored cup of coffee that satisfies a coffe graving and leaves me wanting a second cup. It may be that the shipment I got was bad in some way or that the long-distance shipment damaged the coffee. I think that the fact that the coffee was in a paper bag and not the standard aluminum vacuum bag also contributed to its degradation. Nice. Very earthy but incredibly smooth. This is a really dark roast that is full bodied, so it's my kind of coffee, and the beans are not oily, so my grinder likes it as well. The flavor may be too burnt or over-roasted for some, but it shouldn't deter you from trying it if you enjoy truely dark roast coffee. I really like this one! Good strong taste! I would give 4.5 if I could :) so far my favorite. Smells and tastes like everything I ever loved about coffee growing up. Nice and strong flavor. Smooth taste. Great Coffee. I love the flavor and the smell. It is a great way to wake up. Not a bad cup but not a favorite. This may be my favorite coffee (ever), rich deep flavor, aromatic and filled with bold roastiness, but without any bitterness. A very darkly roasted coffee without going too over the top. I could taste black licorice, some black cherry, a lot of smoke, and hints of burnt toast. Don't like this nearly as much as as the last shipment. Not sure if its the tobacco flavor I don't care for but its very one-note to me. The tobacco flavor is a detractor. My favorite so far. Smooth yet rich. This is, by far, our favorite shipment yet. In fact, this may be our favorite coffee period. It's so rich, and nutty, without even a hint of bitterness. So smooth, so god. We hope we get this one again!!!! Bold, sophisticated roast with an earthy nose. Beans are dark and oily, but the taste is a bit sweeter than a French roast. I would purchase this blend again, as it was unique and memorable. If you close your eyes while drinking this one, you can probably imagine a sunrise campfire. Bright cedar and liquid smoke. Very nice dark, smokey roast! I'm not sure if it's due to my brewing method or a faulty ratio, but I don't care for this coffee. I can definitely pick up on the smokey flavor, but overall it reminds me of a cup of coffee that went cold and was then reheated in the microwave. It was like drinking old, burnt coffee.